In a single candlestick pattern, there is only one candle to show the trading action for the day. The length of the candle shows the trading implication. The longer a candle is the more will be the selling or buying activity. Similarly, a shorter candle portrays less trading activity. Let us understand the different specific single candlestick patterns. We discussed the history and the anatomy of candlestick pattern and got to know what the bullish and bearish candles are, in previous chapter. In this chapter we will discuss the trading types of candlestick patterns in detail. We will read the different types of single candlestick patterns and know what all a single candlestick chart pattern portrays. Definition: In Japanese, marubozu means ‘the bald’. Hence, a marubozu candle only has its main body and has no upper shadow or lower shadow. Also for marubozu, there are two types marubozu candlestick chart patterns: the bullish marubozu and the bearish marubozu. Buying strength and selling weakness. But marubozu is the candle that doesn’t follow the last rule of candlestick patterns, that means it doesn’t depend on the prior trend and it can appear anywhere in the middle of a candlestick chart. The marubozu also can be classified into two types. 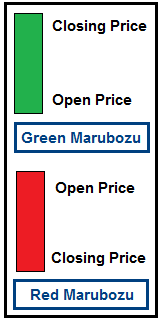 In the image shown, the green candle indicates the bullish marubozu and the red candle indicates the bearish marubozu. Now we know that a marubozu candle has no upper or lower shadow; in a bullish marubozu the lower value is the opening price and the higher value is the closing price. Hence we can say that in a bullish marubozu, Low=Open & High=Close. Looking at a bullish marubozu, we can say the there was a great trading activity for the stock, throughout the day. We can say that there were buyers interested to buy the stocks at almost all price points during the day. It also can be said that the traders were so interested in buying and selling the stocks so that it closed at its highest price of the day. A bullish marubozu indicates that traders are very interested in a stock and this interest will remain for next few days. The closing price for today will more likely be the opening price for tomorrow and a buyer can buy a stock on almost the same price. A trader is supposed to keep an eye on the bullish marubozu candles as it is an appropriate opportunity to trade the stocks. Let us learn to recognize a bullish marubozu candle with example in real candlestick patterns. In the above chart pattern, we can see a green candle in the circle. This is a bullish marubozu candle as it has no upper or lower shadow. Also, the highest price is equal to the closing price of stock and the lowest price is equal to the opening price of the stock. Apposite to a bullish marubozu, in a bullish marubozu the higher value is the opening price and the lower value is the closing price. Hence we can say that in a bullish marubozu, High=Open & Low=Close. A bearish marubozu indicates that it wasn’t a great day for trading as there is much pressure on selling a stock. It shows that sellers sold their stock at almost every price of the day. It also indicates that traders were less interested in buying the stocks rather than selling. Looking at a bearish marubozu, we can say that traders are very less interested in the stock and this will remain for next few days. The closing price for today will more likely be the opening price for tomorrow and a seller can sell a stock on almost the same price. A trader is supposed to keep an eye on the bearish marubozu candles and wait for the appropriate opportunity to trade the stocks. Example of bearish marubozu candlestick pattern: In the image shown above, we can see a red candle in the circle. This is a bearish marubozu candle with no upper or lower shadow. Also, the highest price is equal to the opening price of stock and the lowest price is equal to the closing price of the stock. Alike the name, it looks like a top spinning, with a small real body and almost equal upper and lower shadow. It may not give trading signal with specific entry or an exit point but it provides the useful information with regarding the current situation in the market. 1. Small real body – It shows that the open price and close price are quite close to each other. For example, let us suppose the open price is Rs 180 and the close price is Rs 183. Or the open price is Rs 180 and close price is Rs 177. In both situations, a small real body will be formed as the difference between opening and closing price is very small. As the open and close price points are very close, the color of the candle does not really matter. 2. The upper shadow – The upper shadow is used to indicate the highest price of the day. In a filled black candle (bullish candle) the high price and close price are connected while in a bordered black candle (bearish candle), the high price connects the open price of the day. With the presence of upper shadow, we can say that the bulls tried to take the market higher, but they weren’t that successful. 3. The lower shadow – The lower shadow is used to indicate the lowest price of the day. 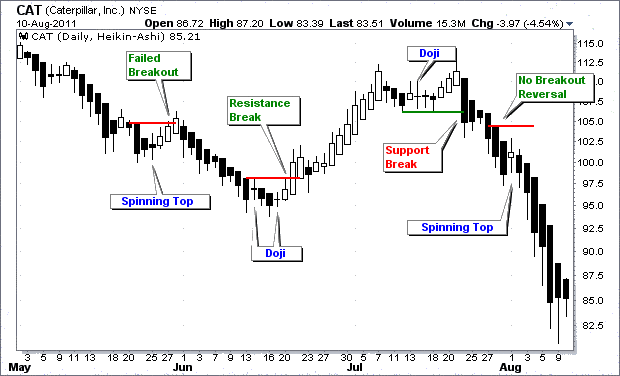 In a bullish candle (filled black candle in chart) the low price and open price are connected while in a bearish candle (bordered black candle in chart), the low price connects the close price of the day. With the presence of lower shadow, we can say that the bears tried to take the market lower, but they weren’t that successful. 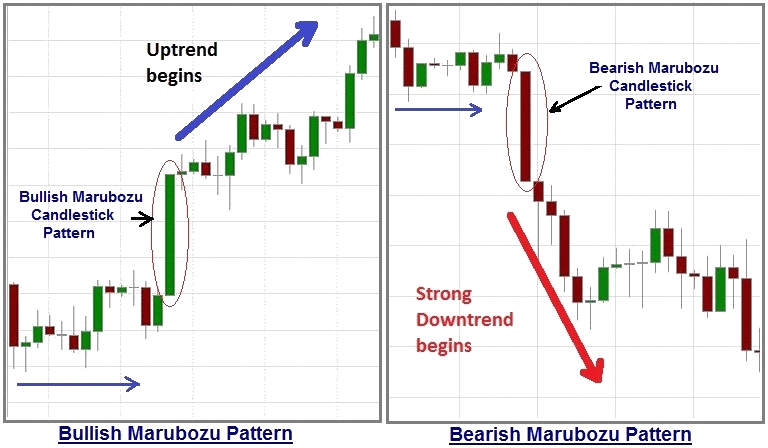 In the above chart, we can see the example of spinning top candlestick patterns and the example of doji candlestick patterns. A doji is much similar to a spinning top; however the difference is that a doji doesn’t have a real body. As it doesn’t have a real body, we can say that the open and close price of the stock is almost equal. A doji provides crucial information about a stock and helps with the trading decisions. A candle with a very thin body can also be considered as a doji as there isn’t much difference between the open and close price of the stock. As a doji has difference between the open and close price, the color of the candle doesn’t matter much. What matters most is that the open and close price is almost equal to each-other. If you see some contiguous dojis in a candlestick chart of a stock, it means there is and indecision in the market and it may swing either ways. » Currently Reading: Different Types of Single Candlestick Patterns. Definition with Examples. » e-Learning Chapter 11: Technical Analysis Quiz – Basics of Technical Analysis for Beginners Module. You guys are really smart ! You have very well drafted technical analysis and provided superb knowledge on fundamental analysis as well. Thanks a Lot, really appreciated.